Art Sawa a leading gallery in the MENA region has over the past three years made a measurable impact on the Art Scene in the region by championing both, well established, as well as emerging regional artists. “Since our launch in October 2008, we have worked tirelessly to promote artists from the region and in doing so, have built the Art Sawa brand as synonymous with the quality and creativity of our artists” said Amel Makkawi Founder and Director of Art Sawa before adding: “Art Sawa is more than a gallery, it is an art platform where exhibitions, talks, workshops comingle to create a unique cultural experience in Dubai, the Art Capital of the region”. Since its inception Art Sawa has introduced a host of artists to the market including established artists such as Rachid Khimoune, Mohammad El Rawas, Camille Zakharia, Essam Marouf, Jalal Luqman, Ahmed Al Bahrani, Mahmoud Al Obaidi, Ibrahim El Dessouki, Hanafy Mahmoud as well as having a major impact on the careers of many more emerging artists such as Zena Assi, Ahmed Askalany, Wael Darwesh , Marwa Adel, Summayah Al Suwaidi, Ali Raza, Karine Roche and many others . Art Sawa started its activities in its anchor 12,000 sqft space in Dubai’s industrial zone of Al Quoz. It has recently decided to expand its presence to what has become the must see Art destination in Dubai, namely the Dubai International Financial Center (“DIFC”) to be closer to its collector base. Maitha Al Falasi, Art and Culture spokesperson of DIFC Authority, said: “We are delighted to have such a prestigious Art Gallery join the fold of so many important galleries in the DIFC. Art Sawa’s focus on contemporary art from the region will help support our position towards supporting arts, and hence towards establishing DIFC’s position as a major financial and business hub in the region”. 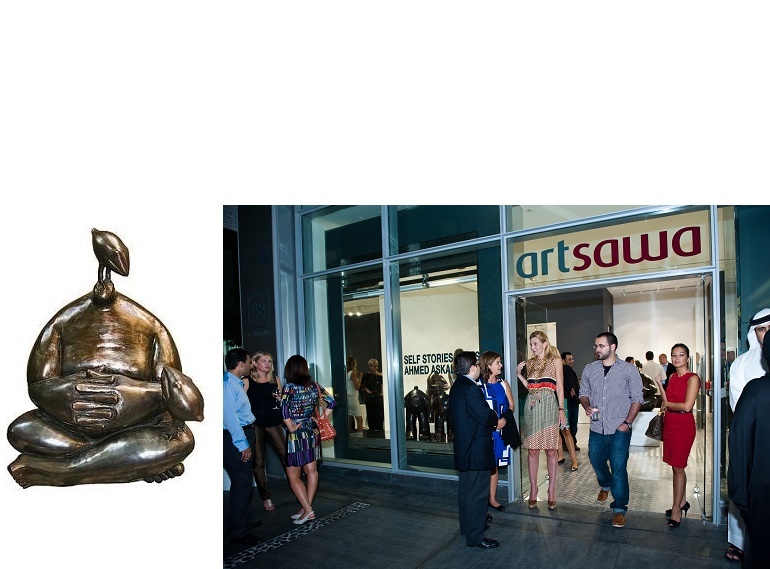 Art Sawa-DIFC opened its doors to the public on September 21, 2011 with a solo exhibition by up and coming and renowned artist-sculptor Ahmed Askalany. Askalany’s subjects are simple human figures and animals cast in Bronze, inspired and representative of his native town, Nag Hammadi, in Upper Egypt. Askalany’s works are characterized by traditional aesthetic forms that place an emphasis on both structure and distorted volumes, where small heads sit on of giant bodies. Askalany who represented his country at the Venice Biennale in 2009 exhudes a sense of innocence and isolation reflecting both frankness, and depth. There is no specific formula that Askalany uses when creating. His works have poetic sensitivity and humor. This connection allows his work to become unique and unmistakable. Askalany’s short career has thus far been blessed with success and his latest body of work is sure to be a favorite amongst the region’s art enthusiasts. To mark the beginning of the exhibition Askalany will be also holding one Sculpture workshop at the Art Sawa Al Quoz on the 22nd of September. The session is open to all those interested in innovative sculpting or simply those with a keen interest in contemporary art. Ahmed Askalany’s latest exhibition is available to view at the Art Sawa -DIFC from the 21st of September.